In 2009, Steve Hodel published his book Most Evil. Hodel had previously wowed the world with his claim that his father was responsible for the infamous “Black Dahlia” murder, and he took his theory one step further to claim that his father was also the Zodiac killer. Immediately following its release, Most Evil was met with skepticism and scrutiny by those who have studied, researched, and investigated the Zodiac crimes. The “evidence” presented by Hodel was viewed as tenuous at best. Even the oldest estimate of the Zodiac’s age placed the killer somewhere in his late thirties to mid-forties at the time that Hodel’s father was at least sixty years old, and the description of the killer did not match, either. Steve Hodel relied largely on his dubious theories which he claims link his father to the Zodiac crimes and most of these theories are based on his geographic and geometric presentations. I posted my review of Most Evil. 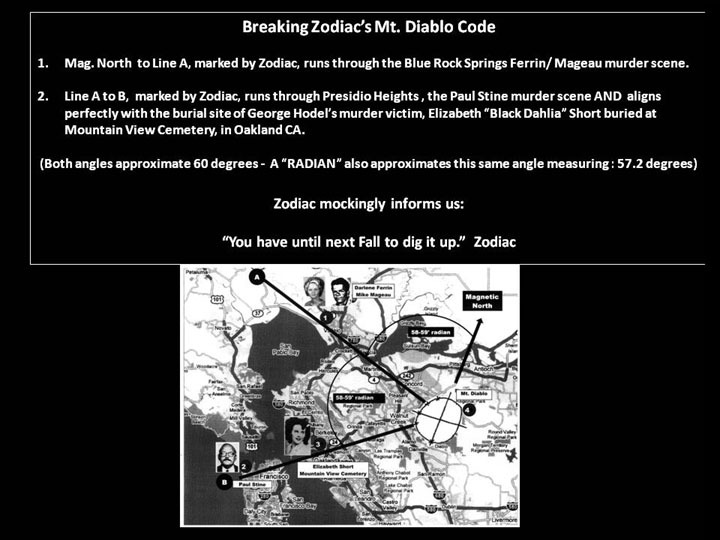 Using simple scrutiny, facts, logic, and common sense, I proved, beyond doubt, that virtually all of Hodel’s Zodiac-related map presentations were completely inaccurate regarding the locations of the Zodiac crimes, the angles they formed, and more. As I noted some time ago, most newspapers, magazines, blogs, newscasters and others would print a retraction after learning of a mistake. Had The New York Times misspelled Steve Hodel’s name, the newspaper would most likely feature an immediate correction in a subsequent issue. Months after Steve Hodel’s entire Zodiac presentation had been thoroughly debunked and discredited, Steve Hodel was still acting as if nothing had changed and his claims still had merit. Hodel made no attempt to correct any of the important geographic and geometric errors in his book, and, instead, he focused on the dubious “suspect” sketch he had used in the hardback edition of Most Evil. Hodel claimed that the sketch in question was produced by authorities when, in fact, the sketch was produced by a professional artist as the cover of a book. The sketch in question is obviously the work of a professional artist. This alone should have given Hodel reason to doubt that the sketch originated from law enforcement. The sketch features the same date as another sketch which bears no resemblance whatsoever to the Adams sketch, further indication that the sketch was not produced by police. No honest person can reasonably suggest that police would produce two entirely different sketches meant to depict the same suspect, let alone do so and issue these sketches on the exact same day. The sketch also features a very stylistic portrait of the Zodiac in costume, even further indication that the sketch was not produced by police. The sketch never appeared or was mentioned in any of the official documents. None of the Zodiac witnesses ever described anyone who remotely resembled the man depicted in the Adams sketch, even further indication that this sketch was not produced by police. Anyone who had spent as much time researching the Zodiac case as Hodel claims would have known all of these facts. 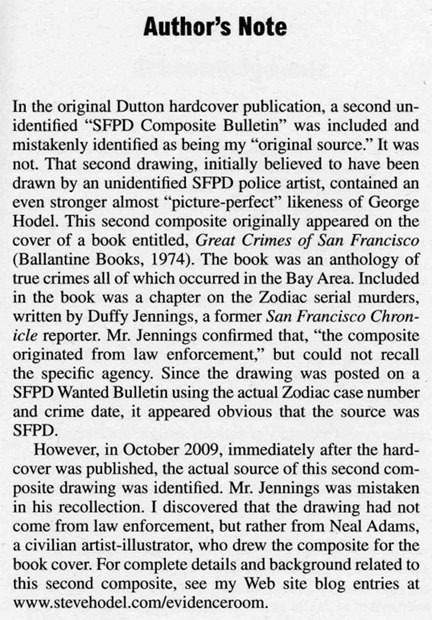 Hodel blames former Chronicle reporter Duffy Jennings for the confusion regarding the origins of the sketch– confusion which Hodel himself created where none had previously existed. 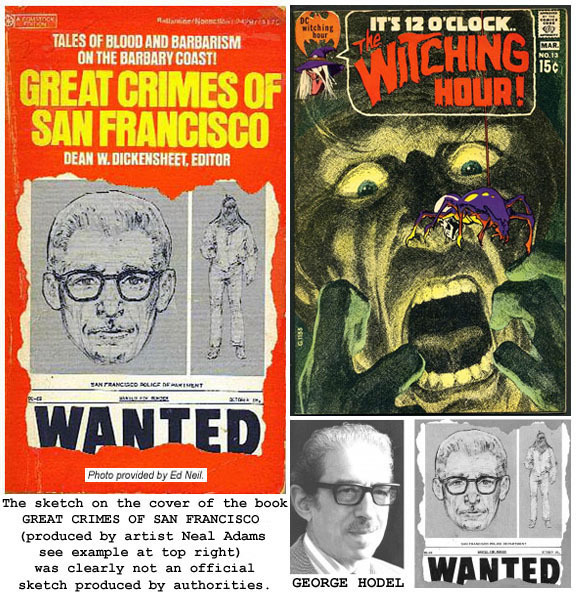 Hodel claimed that an “anonymous source” contacted Jennings and that Jennings said that the sketch on the cover of the book Great Crimes of San Francisco was produced by law enforcement. While Steve Hodel was happy to concede that he, or, rather Duffy Jennings, had made a mistake regarding the sketch, he noted that no other major corrections had been made to the paperback version of Most Evil. In a recent blog entry, Steve Hodel criticized the statements made by Larry Harnisch, owner and operator of a website devoted to the Black Dahlia case. Hodel criticized Harnisch for “misinforming” readers, explicitly implying that Steve Hodel does not do so. Hodel complained that Harnisch’s statements were factually inaccurate and he seemed preturbed by the fact that Harnisch had made this alleged error long after Hodel had publicly presented the evidence to “prove” that Hodel was correct. An examination of Hodel’s “message” in Most Evil and on his website proves that his work is consistently inaccurate and his claims are easily debunked. One of Hodel’s blog entries featured his already-debunked presentations as if they were still valid. STEVE HODEL: In the above diagram, I have inserted and am using Zodiac’s original hand drawn compass circle and cross. I have followed his precise instructions and have positioned his circle to point to Magnetic North. 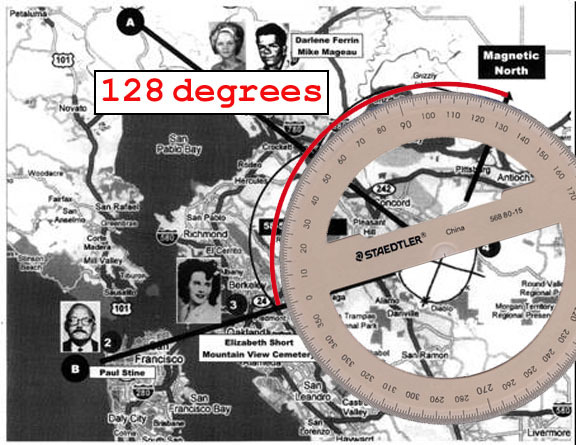 (Tilting Zodiac’s circle approximately 17 degrees east) Zodiac tells us this will reveal where the bomb is buried. Note that Zodiac himself, moving in a counterclockwise direction from the apex has drawn five small X marks on his circle spacing them approximately 30 degrees apart from each other. I have extended his marks by drawing a black line A outward in a northwesterly direction and line B downward in a southwesterly direction. Magnetic north to Line A is approximately 60 degrees and Line A to Line B is also approximately 60 degrees. (“Radian – Noun. Mathematics. The measure of a central angle subtending an arc equal in length to the radius: 57.2958 degrees) Zodiac’s specific use of the term radian informs us he is familiar with higher mathematics and is referencing an angle approximating 60 degrees… Note that by extending a line (A) out from Zodiac’s own positioning of his 2nd “X” not only does it approximate an angle of 60 degrees, but it appears to mark the location of Zodiac’s Blue Rock Springs murder site. 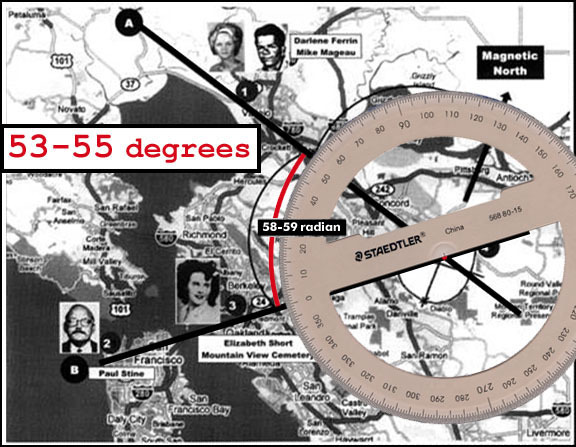 Line B, Zodiac’s 4th X, completes his second angle, also approximating 60 degrees and when extended goes directly through his Presidio Heights, Paul Stine shooting location. But, where is the buried bomb? As originally presented in my sequel, MOST EVIL, I believe it is also revealed on Line B. 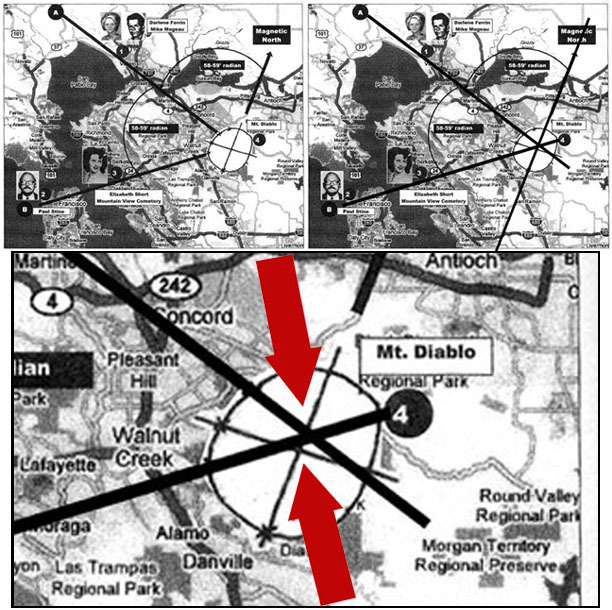 This line not only intersects with his Stine victim, but crosses directly through the exact location where the body of Elizabeth “Black Dahlia” Short is buried in Oakland’s, Mountain View Cemetery. Once again, Hodel’s entire presentation is completely inaccurate. He wrote, “I have followed his precise instructions and have positioned his circle to point to Magnetic North,” yet his placement of Magnetic North is incorrect. Hodel wrote that he had extended his “black lines“ from the peak of Mt. Diablo, yet even his own illustration shows that these lines are not aligned with the peak, and, further, do not even correspond to the apex of the Zodiac’s crossed-circle. Hodel wrote that “Magnetic north to Line A is approximately 60 degrees” yet this angle in his illustration measures at least 73-75 degrees. Hodel wrote that “Line A to Line B is also approximately 60 degrees“ yet this angle in his illustration measures somewhere between 53-55 degrees (perhaps slightly more if one includes the mass of both lines). Hodel wrote, “Zodiac’s specific use of the term radian informs us he is familiar with higher mathematics and is referencing an angle approximating 60 degrees,” yet, if the Zodiac was at all familiar with mathematics he would not use a reference to a radian, an angle measuring 57.3 degrees to imply an angle which measures 60 degrees. 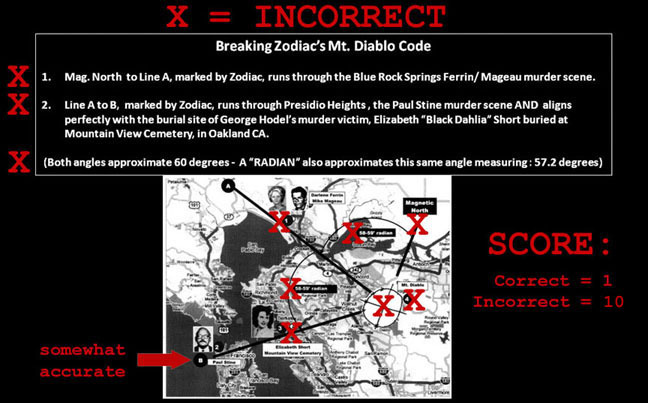 Hodel wrote, “Note that by extending a line (A) out from Zodiac’s own positioning of his 2nd “X” not only does it approximate an angle of 60 degrees, but it appears to mark the location of Zodiac’s Blue Rock Springs murder site.” In his own illustration, Hodel’s placement of the Blue Rock Springs Park murder site is completely inaccurate and far west of the correct location. 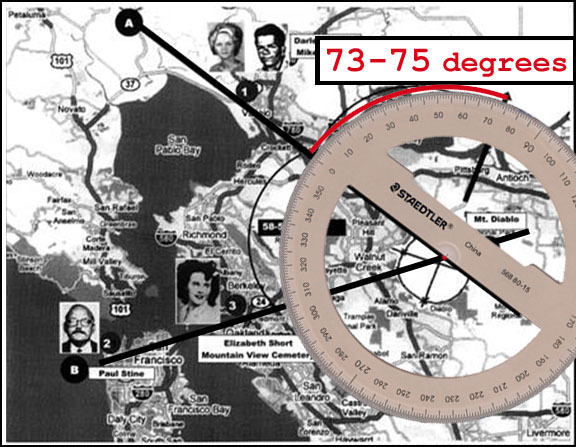 Hodel wrote, “Line B, Zodiac’s 4th X, completes his second angle, also approximating 60 degrees and when extended goes directly through his Presidio Heights, Paul Stine shooting location… This line not only intersects with his Stine victim, but crosses directly through the exact location where the body of Elizabeth ‘Black Dahlia’ Short is buried in Oakland’s, Mountain View Cemetery.” Hodel’s placement of the cemetery is fairly accurate, however, his own illustration accurately demonstrates that the line created by the Stine murder site does not intersect with the cemetery or the Short grave site. Hodel claimed that the two angles in his illustration each measured approximately 60 degrees. If Hodel’s claim is true then both angles should measure approximately 120 degrees, yet, when combined, the two angles actually measure approximately 128 degrees or more. 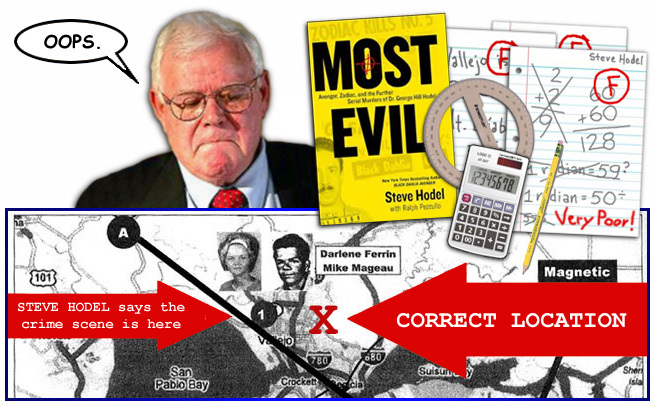 Steve Hodel has never acknowledged, corrected or explained the many geographic, geometric and factual errors in his book Most Evil. To admit that his book is filled with such errors would be admitting that he did not conduct legitimate research, he created his claims without any basis in fact, he never checked his own work, and he has no regard for the facts. Hodel wrote that his critics “attack the messenger, not the message. The investigator, not the investigation.” Steve Hodel’s claims have been thoroughly debunked by logic, common sense, and the facts. One has to wonder just how Hodel could dismiss the debunking of his claims as the biased product of “venoms or agendas.” Anyone can debunk Steve Hodel’s entire presentation in five minutes using just a copy of Most Evil, a protractor, and basic math skills. Steve Hodel’s “message” is pure nonsense, and no one knows that more than Steve Hodel himself.